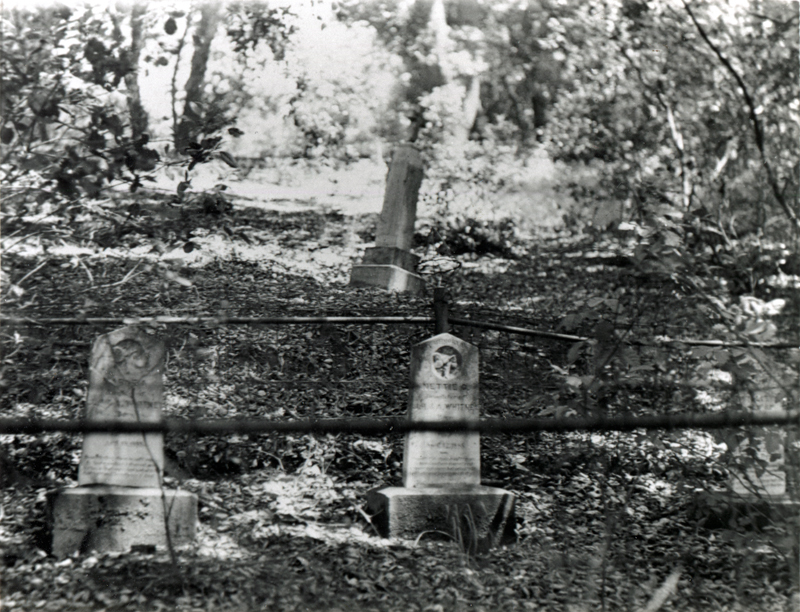 Headstones of two children from the Whitney family of Whitney Canyon (foreground, center and left), in the original Pioneer Cemetery (Lyon family graveyard) near Lyon's Station. Photograph probably mid-1950s, not long before the graves were moved to the Garden of Pioneers at Eternal Valley Cemetery (est. 1958). Mable Whitney's headstone in the Garden of Pioneers at Eternal Valley Cemetery. Photo: Stan Walker. Click image to enlarge. According to local historian Stan Walker, the two headstones in the foreground "are those two girls — Mable A. and Nettie O. In the photo, you can see 'Whitney' on both stones and 'Nettie O.' clearly on the right stone. Only Mable's stone still exists. The fate of Nettie's stone is unknown. Today , Mable's stone is very weathered and hard to read. Eternal Valley records show this as Plot 118, Sites C & D, containing a baby Whitney." and light and beauty ere it died. 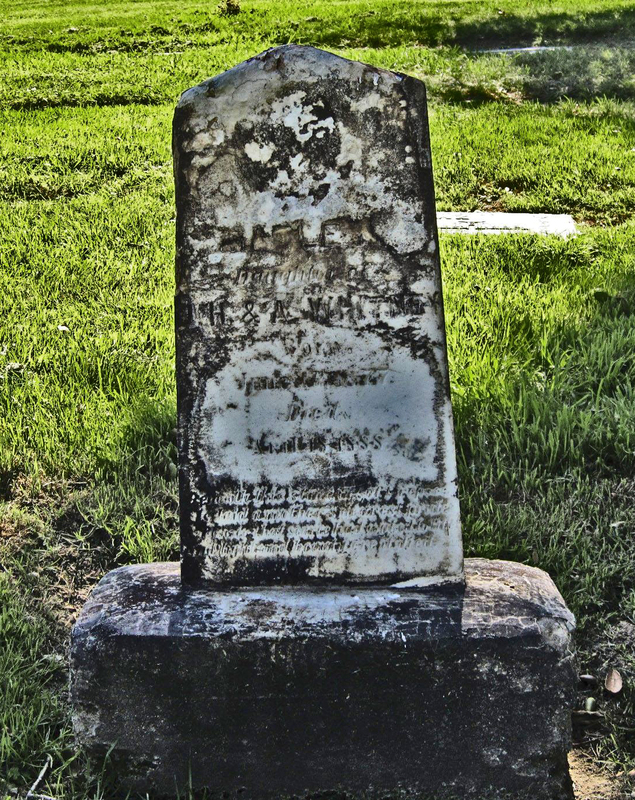 According to Perkins' "History of Eternal Valley from 1769" (1958), both Nettie's and Mabel's headstones bore the same eulogy; Nettie died in 1884 at age 8 and Mabel in 1888 at age 10; and the Whitney's first child, Willie, died in 1881 and is also buried at Eternal Valley. Perkins says all three died from diphtheria. Walker was unable to locate Willie's grave. Closeup of third marker at right-foreground, partially obscured by foliage. Click image to enlarge. 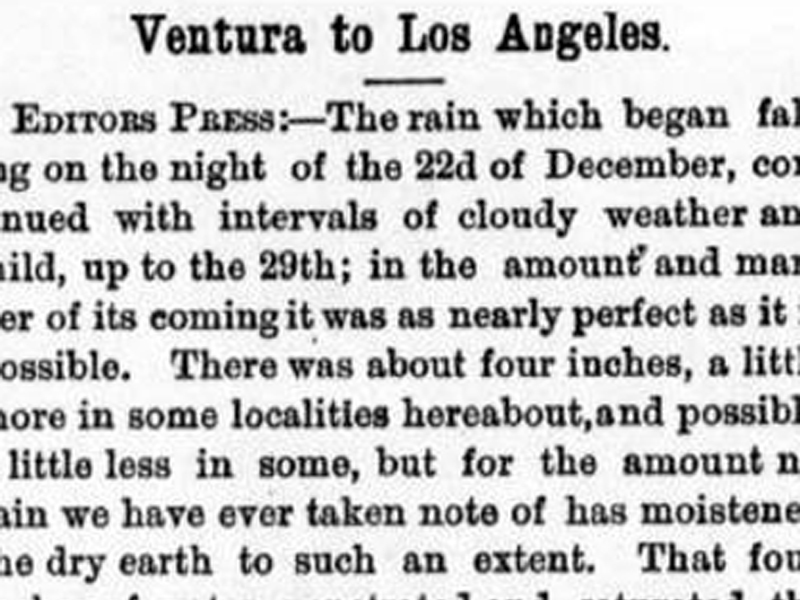 Sanford Lyon was born Nov. 20, 1831, in Machias, Maine, came out West in for the 1849 Gold Rush and arrived in the Santa Clarita Valley, in the area that would become Newhall, as early as the 1850s. He ran (and with twin brother Cyrus, co-owned) a stagecoach station at the northern foot of the San Gabriels, in a location that can be described in today's terminology as the entrance to Eternal Valley Cemetery off of Sierra Highway. He spent his spare time galavanting about the territory looking for oil, with moderate success. "By 1868 [Lyon's Station] consisted of a large-frame building housing a store, post office, stage depot and tavern. Behind that the family cottage was hidden among stately oaks, while up the hill were some board-and-batten residences for twenty of Lyon's employees and their families. There a cemetery was established, where such names as Rivera, Whitney and even Lyon were eventually inscribed into headstones. Across the road that would one day be known as Sierra Highway loomed a red, New England-style barn, surrounded by corrals and sheep pens, with cattle roaming free over the steep hills. Today the place goes by the name of Eternal Valley." In 1888, Kansas Gov. 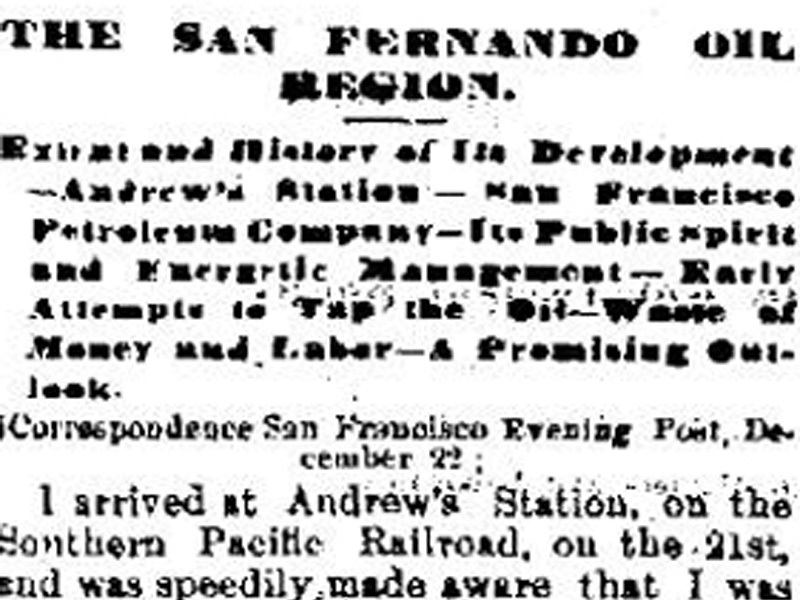 John St. John purchased a 10,000-acre swath of land from The Newhall Land and Farming Co. that included the former Lyon holdings, which stretched from today's Old Road (just west of Interstate 5) to roughly the 14 Freeway. St. John eventually gave up on his plans to turn Newhall into a prohibition colony, but his ranch foreman, Henry Clay Needham, remained in the area and retained 750 acres that included the former station and burial site. The acreage stretches from Sierra Highway to Pine Street. Needham died in 1936; in 1957 his heirs sold his 750-acre holdings to Gates, Kingsley and Gates Inc., a family-owned funeral directorship headed by Mark T. Gates Sr. In 1958, the County of Los Angeles approved Gates' application to establish Eternal Valley Cemetery on a 220-acre section of the property. The burials at the original, long neglected Pioneer Cemetery, including Sanford Lyons' remains, were moved to the new Garden of Pioneers a short distance away at the new cemetery. Headstones which had been allowed to fall into disrepair were mended and uprighted; it's the only section of the cemetery where upright markers are allowed. Gates, Kingsley, Gates sold the Eternal Valley property in 1972, when Mark Sr. died (b. Dec. 29, 1907 in Nebraska; d. July 12, 1972, in Los Angeles; interred at Eternal Valley) — but retained 584 acres of the former Needham Ranch. Under new ownership, Eternal Valley has continued to expand within the confines of its original 220 acres. Meanwhile, in 2003, the City of Santa Clarita approved plans for the development of a business park by Gate King Properties LLC — a new iteration of Gates, Kingsley headed by Gates' son, Mark Jr., in partnership with the new cemetery owner and with another adjacent property owner (on the Pine Street side), Hank Arklin. AP1036: 19200 dpi jpeg from copy print.